Continuing our Apps of the Month Feature, here's a round-up of some of our favorite educational apps released or updated over the course of the month, which includes Android, iPhone, and Web applications. If you want to let readers know about your favorite educational app, tell us in the comments. 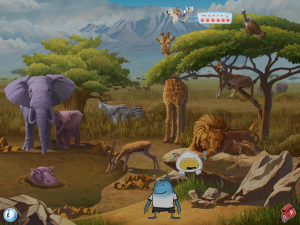 Ansel & Clair's Adventures in Africa is one of those rare joys that combines beautiful graphics and engaging gameplay with educational content. Ansel and Clair are aliens who must recover their lost spaceship parts, and as they travel the continent (the Serengheti, the Nile River Valley, and the Sahara Desert) they not only work on that mission but learn about the geography and history of the area as well. The app takes full advantage of iPad technology -- audio, video, the touchscreen, "tilt the iPad" games, and so on.You can have separate accounts, so different users can move through the the story at their own pace and it's suitable for a wide age range (the iTunes lists the app as 4 and up). Kids have have ample instructions on how to proceed, but it's open-ended enough for them to have their own way of interacting with the content. Lots to explore here. Both parents and children say that having cellphones makes them feel safer and helps maintain communication channels. But often just texting to let parents where a child is isn't enough. So I'mOK has created an app that rewards children for doing more than just sending a text message. The app lets kids flag their location, tag the friends they're with, and upload pictures -- all in the service of helping give parents a better idea where they are (and hopefully decrease the need for nagging or spying). 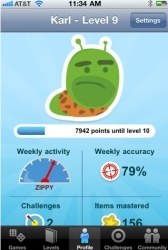 In exchange for being forthcoming with their data, the app lets kids earn points, which in turn parents can use to reward kids. The app is still in private beta, but should be available for wider use this summer. 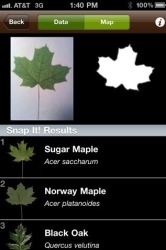 Leafsnap is an electronic field guide for both iPhone and iPad that uses visual recognition software to identify tree species based on photographs of their leaves. The app, which is being developed by researchers from Columbia University, the University of Maryland, and the Smithsonian Institution, currently includes trees from New York City and Washington DC, but the project plans to expand to include the entire United States. StudyBlue allows students to maintain their class notes and transform them into study guides, flashcards, and practices quizzes. The site also lets students schedule text-message reminders about when and what to study next, as well as post messages to Facebook warning others that they're studying and shouldn't be disturbed. This month, the note-taking app Evernote announced an integration with StudyBlue, making it easy to import your Evernote notes into your StudyBlue account so you can more easily make and share flashcards from the materials you've stored in Evernote. The language-learning startup MindSnacks released an Italian language version, available for free for iPhone and iPad. The idea behind MindSnacks is to offer a mobile gaming and learning experience to help you learn and brush up on your vocabulary. The app offers 50 levels of language content, each level featuring 25 Italian words and phrases. The games are meant to help students learn and memorize words and phrases with fun and challenging mini-games. MindSnacks is also available for Spanish and French. PBS KIDS released an iPad app -- PBS KIDS Video -- that gives access to over 1000 streaming videos from various PBS KIDS' series, including The Cat in the Hat Knows A Lot About That, Dinosaur Train, and Sesame Street. The app also includes information about local PBS stations' TV schedules and the ability to mark series as "favorites." TripLingo released its first six iPhone apps -- Mexican Spanish, French, German, Italian, Brazilian Portugese, and Pirate (Arr, yes, Pirate) versions. TripLingo offers a very unique way to learn just the words you want to and need to learn for travel. The app lets you customize your phrase list, based on your interests, your planned activities, and on any special circumstances. When you launch the app, you walk through a series of questions that lets you rate how important certain subjects are to you - do you want to know about sports lingo? Do you want to know how to flirt? Do you want to go shopping? More importantly, arguably, are you travelling with children? Are you diabetic? Are you disabled? 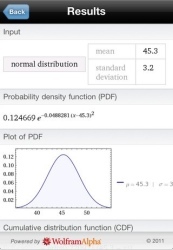 Computational knowledge engine WolframAlpha released several more apps in its Course Assistant series, including apps for General Chemistry, Precalculus, and Statistics. The apps help students understand basic concepts in these subject areas and solve homework problems. Rather than "canned answers," the apps will help solve specific questions. May also marks the two-year anniversary of WolframAlpha, which founder Stephen Wolfram describes as an "absurdly complex object." The New York Public Library released its first app, available via iTunes: Biblion: The Boundless Library. The app is a re-launch of the library's Biblion journal, but in a format specifically designed for the iPad. The first issue features items from the library's collection from the 1939-1940 New York World's Fair -- documents, images, essays, film and audio that let you explore the library's stacks "opening up hidden parts of the collections and the myriad story lines they hold and preserve." The cartoon-creation tool Toontastic released an updated version featuring 3 new space-based settings (and more space-related characters), new drawing tools, faster uploads to ToonTube, and the ability to save your custom-drawn characters and backgrounds so you can use them in any scene or cartoon. The app is available for iPad and costs $3.99.